Lotte World Tower in Jamsil, Seoul, on a clear day and amid the dust. 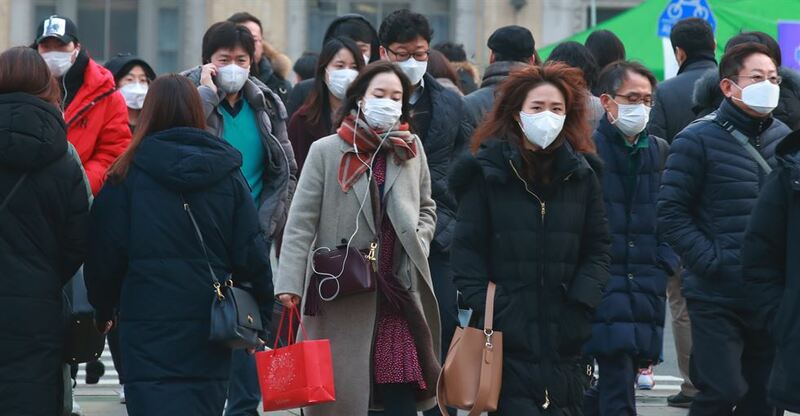 Almost all Koreans are suffering from physical or mental distress due to airborne ultrafine dust that has blanketed the nation for days, a survey showed on Tuesday. In an online survey of 731 adults by recruiting website Incruit, 97 percent of them have found it difficult to live in the contaminated air and 93.7 percent called on the government to take a "nationwide countermeasure." Nine out of ten said the ongoing air pollution has left them with "physical or mental" distress. The No.1 complaint (16 percent) was eye disease and "fear of ventilation" into their homes. Next were respiratory disease (15 percent), cognitive pressure to wear a mask (13 percent), fear of doing an outdoor activity (9 percent), overall deterioration of health (7 percent), headache (7 percent), vision reduction (5 percent), lung disease (3 percent) and consideration of immigration (3 percent). Among safety measures, wearing a dust-filtering mask was the most popular (33 percent), followed by staying indoors (24 percent), regular dust-level checks using an app (21 percent) and installation of an air purifier (17 percent).